We are very proud to have such a fantastic choir as part of the Civil Service family. Etcetera is no ordinary workplace choir. 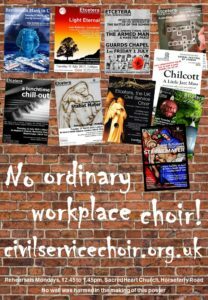 It is the largest and most thriving choir in the Civil Service, with members drawn from government departments, agencies and other institutions in Westminster and with an ever growing reputation as simply the Civil Service Choir. In February 2018 we featured in a BBC Radio 4 documentary about the Civil Service and Brexit. Hear a selection of our concert performances. We are honoured to be able to perform great public concerts in the prestigious and magnificent baroque concert venue of St John’s Smith Square; in the beautiful Victorian church of St Stephen’s, Rochester Row; in the Guards’ Chapel, Wellington Barracks; and at events in various Government Departments in Westminster. We undertook our first tour in October 2018 during which we sang at the Menin Gate Last Post Ceremony in Ypres and gave a concert at the church of St Walburga in Bruges, Belgium. We gave our seventh concert at St John’s Smith Square in April 2019. To a packed hall we performed Schubert’s two settings of Stabat Mater as part of the Holy Week Festival.